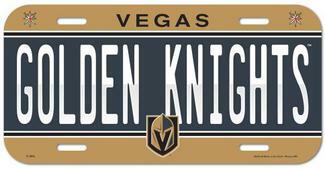 Officially licensed 6"x12" License Plates made of durable plastic. The plate is a great souvenir decorator piece. Made in the USA by Wincraft. License plates will fit the plate frames also offered. Click on the desired team(s) to see the current design. Choose the total number to purchase to get a quantity discount. Prices shown are for a MINIMUM order of 6 plates. Less than 6 total license plates will cost $3.75ea. Mix or match among all team license plates. Price discounts are: 12 plates @ $2.55 ea. / 36 plates @ $2.45 ea. / 60+ plates @ $2.25 ea. 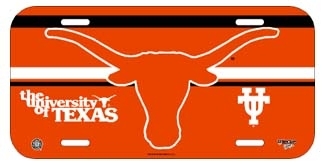 Officially licensed 6"x12" License Plates made of durable plastic. The plate is a great souvenir decorator piece. Made in the USA by Wincraft. License plates will fit the plate frames also offered. Click on the desired team(s) to see the current design. Choose the total number to purchase to get a quantity discount. Prices shown are for a MINIMUM order of 6 plates. Less than 6 total license plates will cost $3.75 ea. Mix or match among all team license plates. Price discounts are: 12 plates @ $2.55 ea. / 36 plates @ $2.45 ea. / 60+ plates @ $2.25 ea.